You Need Us Now More Than Ever. Many pathologists and laboratories are suffering from a simple lack of revenue management. Your payments will get worse if you choose to do nothing. You need to start auditing your billing and collection process and negotiate for more revenue. Vachette Pathology is a pathology and laboratory practice management and hospital consulting firm. We currently manage over 50 pathology and laboratory practices coast-to-coast. They range from single man pathology practices to independent laboratories to 35 hospital based practices. Our Practice Managers have extensive experience in the field of hospital and laboratory billing. We can help to increase your revenue and secure your income. Pick up the phone and call me and let�s start increasing your income today, contact Mick Raich toll free at 866-407-0763 or at mraich@vachettepathology.com. Visit us online by clicking here. (1) We have a Special offer thru 4/30/2012 for our Jobs page. Post a Pathologist/PhD Job ad for the regular price of $800, and receive one FREE posting for a Job-Other ad (normally $500), if sent to us within 2 business days. (2) We have added links for free CME from Cleveland Clinic to our CME page, which has a link on the left side of the Home page. (3) The second half of the Lymphoma and plasma cell neoplasms chapter (T/NK cell disorders, Hodgkin's lymphoma, post-transplant, other) was recently updated based on a review by Dragos C. Luca, M.D., Children's Hospitals & Clinics of Minnesota. The balance of this chapter was updated in early 2011. 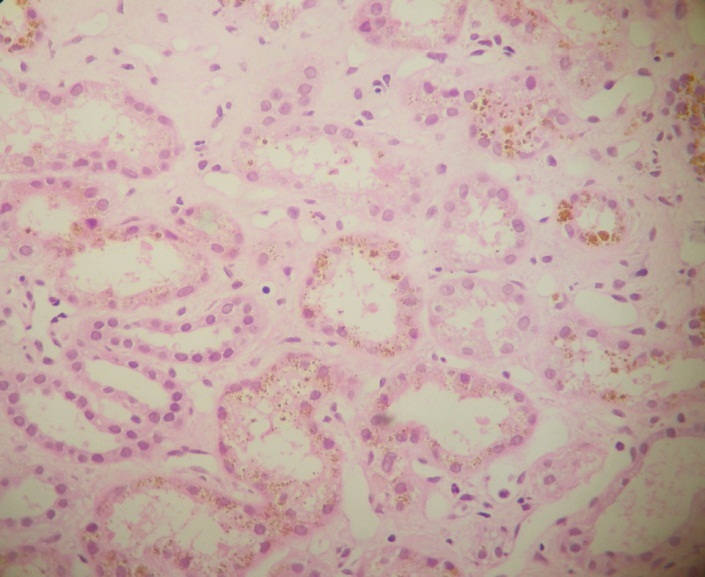 A 52 year old Asian man, hypertensive for 7 years, presented with slowly increasing serum creatinine levels, currently 3.1 mg/dl, and current renal failure. 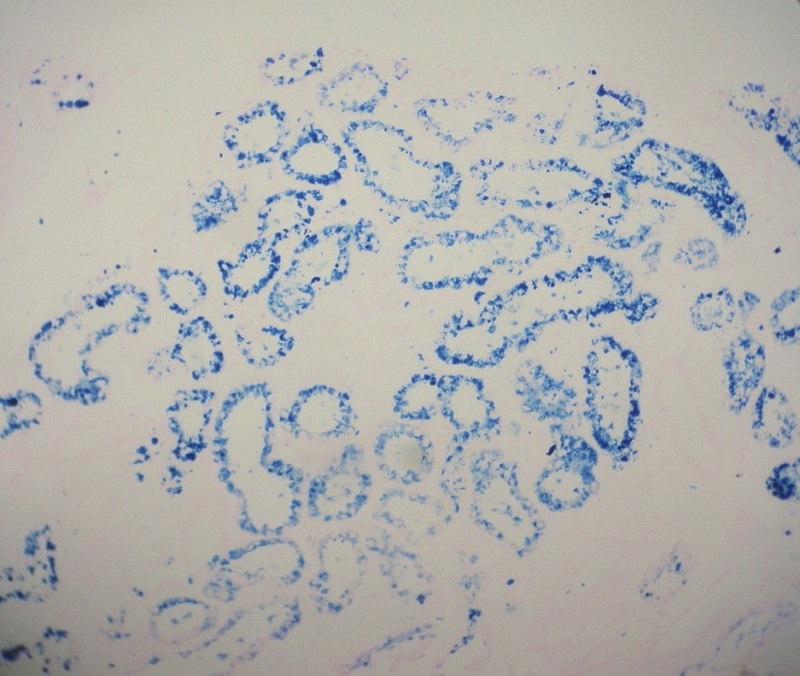 Urine showed microscopic hematuria. His past medical history included a heart valve replacement due to valvular heart disease at age 30 years. 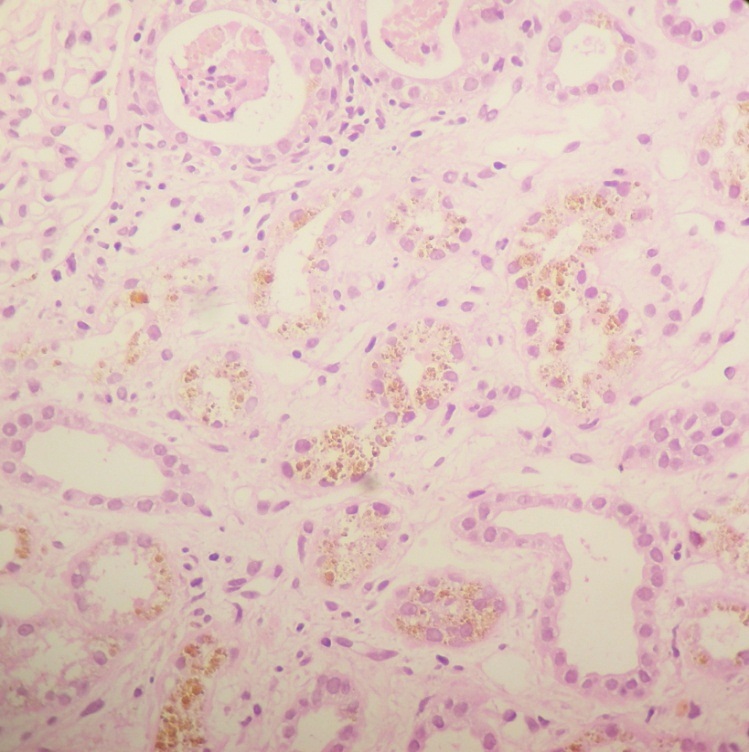 As the etiology of the increasing creatinine was unknown, a renal biopsy was obtained. Renal hemosiderosis due to hemolytic anemia is a rare cause of renal failure (Am J Pathol 1966;48:409, Indian J Pathol Microbiol 2011;54:379). Hemosiderosis is defined as the histologic equivalent of secondary iron overload, usually due to hemosiderin, which may be focal. Hemosiderin is a golden yellow to brown granular cellular pigment due to hemoglobin breakdown. 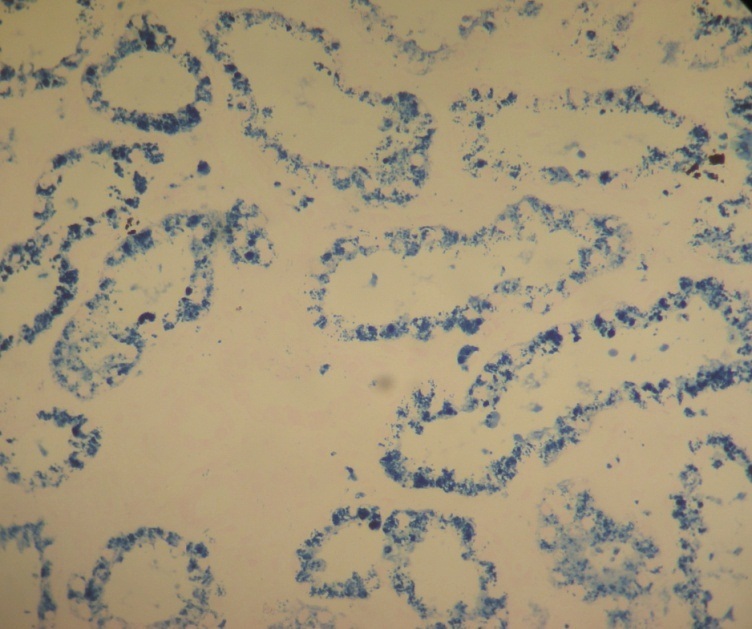 Typically, free serum hemoglobin is bound to haptoglobin, but in severe cases, the free hemoglobin is filtered by the kidney and deposited in the proximal convoluted tubules, which may cause renal failure. In this case, the hemolysis was attribute to chronic mechanical damage due to shearing of red blood cells by the prosthetic valve. Correction of a dysfunctional value may be therapeutic (Arch Mal Coeur Vaiss 1993;86:111).